Revising ICT: Students will cover a number of tasks based on students prior knowledge and skills in ICT. This unit aims to provide students with the key skills necessary to progress in this subject during the course of Key Stage 3. Topic also includes file management, email skills and introduction to e-safety and learning about different types of computer components. Homework: Students are given a range of methods to complete their homework tasks throughout the year. Each will focus on a different topic relevant to what is being completed in the current unit. How to help: Discussing the dangers, how to stay safe, etc when using the internet to communicate with others, social networking, privacy settings, etc. and how to stay safe. Bowsley Zoo: This project covers reliability and bias of information we see and read each day; validity of the sources used e.g. websites; searching databases; using search engines effectively; interrogating a database and presenting the information in a suitable format for the Zoo. Worksheets based on embedding the practical skills covered in class – database features, spreadsheets tools and features. Both of these websites will be useful to help with features of databases and software covered in this unit. 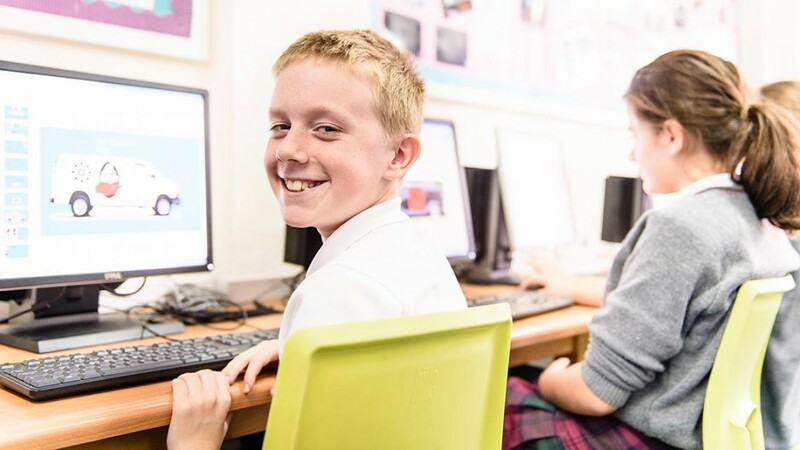 Computing: This unit provides the students with an introduction to the new Computing curriculum which will be developed and extended throughout the key stage. They will be introduced to computer networks, practical activities with computer components and programming using Scratch. How to help: Scratch is a free program which can be downloaded for use at home so that students can continue to develop their skills independently. Dragons Den: This unit is based on creating a pitch to the Dragons in the Den. Students work in small groups to set up and brand a new company in the local area selling digital entertainment, e.g DVD’s, games, music, etc. They will learn to work in group, considering other people’s opinions, gathering and acting on feedback and developing an understanding of what makes a business successful including its corporate image. Homework: Homework is set on a regular basis based on research and planning individual ideas to bring to group discussions in the next lesson. Additional homework is set to embed ICT and Computing knowledge and understanding throughout the year. School Ski Trip Students are given a range of problems associated with organising a school ski trip and asked to find suitable solutions using a range of software packages. The problems range from advertising the trip, to monitoring student payments, right down to parental letters. Homework: Using the creative homework activities, students will be given a topic to complete over a number of weeks. This allows all students to access a homework activity that they are comfortable with, whilst also evidencing their knowledge and understanding of given topics. Computing 2: Students will revisit the programming and computing skills introduced in Year 7 and develop these further. They will learn about HTML language and how its used to create websites. They will also learn about data transmission, operating systems, binary and algorithms. Homework: Worksheets will be used throughout the project to support the practical skills covered in class and embed knowledge and understanding of modelling techniques. Additionally they can use Code Academy at home to continue developing their HTML and CSS skills, as independent learners. Trends in Computing In this project, students will research the trends and developments in a chosen topic of Computing e.g. Mobile phones, games consoles, computers in music, etc. The second topic this term is computer hardware. Students learn about computer components. The functions of internal components. Also, peripherals and their functions e.g inputs, outputs, storage devices. Skills covered: research and effective search skills to identify key elements in the development of their chosen topic. DTP to produce a timeline of development. Presentation or DTP to present findings of the research project to class teacher for assessment purposes. In the hardware topic students will complete practical activities relating to adding and changing computer components and external peripherals. Homework: Homework will be based on researching their chosen topic and identifying ethical, moral and social issues related to the developments identified. Key technical terms are also an essential part of their presentation and students should use homework time to ensure they continue the research project to identify these and fully understand the main features in the advancement and development. Students will need to revise to prepare for a short formal assessment based on their knowledge and practical work on the hardware topic. How to help: students will need to research the best websites to get their information from. Marks are awarded for detail and understanding in the final presentation. So their research forms a vital part of their final outcome and the level of knowledge and understanding evidenced. Students can opt to take the Entry Level Certificate qualification in Computing in the Summer Series – using the work covered this year. Programming Students will be involved in planning the flow of a program, including flowcharts, pseudo codes and algorithms. They will also learn about variables and sequencing and the use of Boolean operators to execute selections and conditions within a program. They will also be expected to develop an understanding of iterations and loops and be able to test and evaluate their own program designs and effectiveness. Skills covered: Programming to meet a given scenario. Including writing algorithms and flowcharts to solve a given problem. This piece of coursework will be assessed on the success of the program and their ability to evaluate and amend their design based on effective testing. Homework: This term homework will be based on the theory behind programming and the importance of flowcharts and pseudo codes to execute an effective program. Additional homework sheets will be given on a weekly basis to develop knowledge and understanding of this topic. Logic and Software Students will work on two different projects this term. Both projects will be assessed with a short test to measure understanding, skills and knowledge. Skills covered: Logic project – binary numbers. Converting binary to denary. Logic gates such as AND, OR, NOT and sequencing of instructions in a logical order. Software project – functions of operating systems, application software and utility software. A clear understanding of the differences of each is important. Homework: Students will be given weekly homework to extend their learning in class and revision for the end of topic assessment. How to help: Students may need to ask questions on software used at home and specialist software used in different jobs/industry. Creating a digital video sequence: This is an optional unit were students create a portfolio of evidence based on a given scenario. They work on the planning, preparation, creation and testing of a digital promotional video for the school, from a student perspective. Students will be need to understand the different quality and formats of video files and footage, edit still and moving images and explain the need to consider location, light, sound, etc. in the final video product. Homework will be set on a weekly basis and will help to prepare the students for the external theory examination. Additionally, students will have sample exam questions to answer on a regular basis to prepare them for their final examination – getting them acquainted with the responses and depth needed to successfully answer examination questions in the summer sitting. Additional resources will also be available in the student revision booklets and checklist folders. Creating a digital video sequence: Continuation of the portfolio of evidence. Students will be creating and editing the digital video footage and images they have chosen to use for the project. Ensuring all elements are fully tested and improvements made (based on feedback from their target audience). Final submission of project – February half term. Pre-Production skills: This unit is the mandatory external examination. They will learn the theory behind planning and preparation for a range of digital media products and documents. This unit will enable learners to understand pre-production skills used in the creative and digital media sector. It will develop their understanding of the client brief, time frames, deadlines and preparation techniques that form part of the planning and creation process. Planning is an essential part of working in the creative and digital media sector. They will understand the need for, and the use of documents such as mind maps, visualisation diagrams, mood boards, scripts, work plans, etc. and how they contribute to an effect product and meeting client requirements. Homework: The homework this term will be used to reinforce the theory elements of the course preparing the students for their external examination in the summer series. Additionally, students will have sample exam questions to answer on a regular basis to prepare them for their final examination. Pre-production skills: Continuation of preparation for the external examination, this will be sat in the May/June series. Following the completion of this unit students will start to prepare for the mandatory portfolio of evidence – Creating Digital Graphics, based on a given examination board scenario and client brief. Homework: Homework time should be spent gathering materials and sources to include in the presentation unit. Additionally, students will have sample exam questions to answer on a regular basis to prepare them for their final examination – getting them acquainted with the responses and depth needed to successfully answer examination questions. Additional resources will also be available through the student revision books and exam questions. Creating an interactive multimedia product: Students work on a given scenario based on creating an interactive product for a business. This will involve using a wide range of functions and features to allow the user to interact with the chosen product whilst making it fit a target audience and purpose. Using videos, still images, buttons, triggers, etc to allow the user to choose their pathway through the product and ensuring that the business is promoted accurately and in an exciting and engaging way. Homework: Students will have sample exam questions to answer on a regular basis to prepare them for their final examination – getting them acquainted with the responses and depth needed to successfully answer examination questions. Understanding computer systems: Students will be working on the pre-released materials to prepare for their external theory examination. The case study will advise on a range of skills, knowledge and understanding that they should focus on, enabling them to answer questions on a given case study. Homework: Examination questions and papers will be set on a regular basis to prepare student for their final examination in the summer. Handling Data using Databases: Students will prepare their final portfolio of evidence for this course. They are given a business scenario with a range of problems and they must complete suitable solutions and detailed evidence of using database software to meet the client brief and requirements. Final submission of the unit will be Easter. Homework: Students should use the allotted homework time to revise and prepare for the theory examination paper.